Beets? No. BEETS? No…well, okay. Yes, beets. Really, beets? YES, I MADE SOMETHING WITH BEETS. Beets are a root vegetable, and what do I love to do with root vegetables? Say it with me: PUT THEM IN THE CROCK POT. So, yes, these beets went into the crock pot. And what was the verdict? Could’ve used even more beets! HA! What a surprise. Not only did the beets come out well, but the beef I paired them with came out even a little sweeter than usual, thanks to the yummy sweetness of the beets. And, even better, you can cook this dish for 8-10hrs or you can stretch it out longer if you need to (as I did, since we had to leave the crock pot on for closer to 11hrs). If you’re trying to find something to do with the beet greens, since you don’t necessarily want to waste them, just wash and dry them, then toss them in a skillet over medium heat and a small amount of olive oil for a few minutes to wilt them. Add a splash of balsamic vinegar and you have a great, crunchy, green accompaniment to your meal! This dish pairs nicely with just about any starchy side; we had it with egg noodles one night and rice another night. 2. Wash the beets well and cut off the stems and roots. Chop the beets into quarters. Add the beets to the crock pot to make a bed for the beef. 3. Add the beef to the crock pot. 4. In a measuring cup or bowl, stir to combine the beef broth, red wine and red wine vinegar, then pour over the beef and beets. Cover and cook on LOW for 8-10hrs. 5. Just before serving, remove the beef and beets from the crock, leaving the liquid in the crock. Add the garlic powder to the crock and stir to combine. 6. In a small bowl, stir water into the cornstarch until the cornstarch has dissolved. Add the cornstarch/water mixture to the crock and stir to combine. 7. 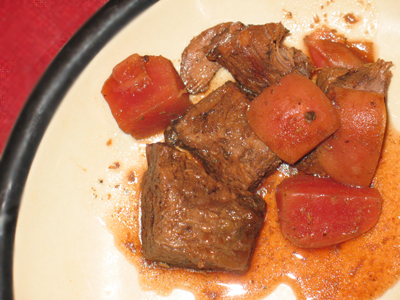 Put the liquid into a gravy boat and serve atop the beef and beets. What a great recipe, slow cooked beef is simply amazing. I’m also not a beet fan, but hubby wanted to grow some this year. I have a few sitting in the fridge as I hem and haw on what to make. I found it! I’m making THIS! Thanks! !